Container fleet refers to the concept of containerization through sea in an intermodal transportation process. The increase in use of high capacity vessels or ships reduces the cost of containers as they can store more number of containers at a time. This, coupled with the rapid increase in use of fleet management systems are likely to push the growth of this market upward in the next few years. In the intermodal transportation procedure, the goods are not required to unload or reload from the containers and due to this the intermodal transportation is in high demand in the container fleet market. Moreover, the refrigerated cargo containers help the container fleet market to transport fresh vegetables, fruits, medicines, and meat, while maintaining their temperature thus reducing the risk of damage. Spurred by these factors, the demand for container fleet is expected to rise considerably in the coming years. As manufacturers look towards integrating analytics, the container fleet market will scale higher. Incorporating analytics will the help in dealing with network related issues such as terminal operations, container utilization, and also vessel deployment. However, large capital investments involved in the container fleet market can limit its scope for expansion in the coming years. 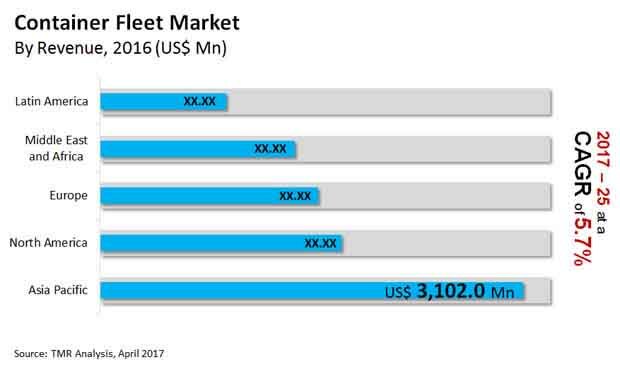 The global market for container fleet stood at US$8812.4 mn in 2016. Rising at a CAGR of 5.7% from 2016 to 2025, the global container fleet market is likely to reach US$14.41 bn by the end of 2025. On the basis of geography, the global container fleet market is segmented into North America, Europe, Asia Pacific, Middle East and Africa, and Latin America. Among these regions, Asia Pacific dominated the market for container fleet in 2016, followed by North America. These regions collectively accounted for more than 50% of the total revenue generated by the market in 2016. However, Asia Pacific is projected to grow at a higher pace during the forecast period followed by Europe, North America, Middle East and Africa and Latin America. Industrialization witnessed across the emerging Asia Pacific nations has been the chief driver of the container fleet market. The rising industrial activities have stoked operations across oil and chemicals, retail, and automobiles industries. As container fleet provides one of the most trusted methods of transport, the demand for the same corresponds directly the growth in the aforementioned industrial activities. Furthermore, the demand for agriculture goods and mining products is exponentially rising in Asia Pacific, which has boosted the container fleet market. Considering this, Asia Pacific held the leading share of 35.2% in the global container fleet market in 2016. Furthermore, exhibiting the highest CAGR during the forecast period, the region is expected to retain its dominance in the market, followed by North America. Based on type, the global container fleet market is segmented into reefer containers, dry containers, and tank containers. Of these, dry containers held the largest market share in the container fleet market in 2016. Dry containers are found useful for transport of various items hence are in demand across all major industries in container shipping. However, during the forecast period reefer containers are projected to be the fastest growing segment in the container fleet market. This is due to the refrigeration capabilities offered by the reefer containers that help controlling t temperature of goods such as fruits, vegetables, meat and medicines while in transit. The automotive, oil, gas and chemicals, mining and minerals, food and agriculture, retails and others constitute the primary end users in the global container fleet market. Of these, the automotive industry held the largest share of 20.4% in the market in 2016 followed by retails. However, the mining and minerals sector is estimated to report a higher growth rate during the forecast period. The major players in the container fleet market are Hapag Lloyd (Germany), Maersk Line (Denmark), Westfal-Larsen Shipping A/S (Norway), Kawasaki Kisen Kaisha Ltd. (Japan), Evergreen Marine Corporation (Taiwan) Ltd. (Taiwan), China Ocean Shipping (Group) Company (China), Mitsui O.S.K. Lines, Ltd (Japan), CMA CGM (France), Mediterranean Shipping Corporation S.A. (Switzerland), Hyundai Merchant Marine Co. Ltd. (South Korea). The conceptualization of container fleet refers to the transportation industry through sea, which ships goods worldwide. The concept of container fleet is also known as containerization which is an intermodal transportation. Transporting good through is the cheapest form of shipping in the intermodal transportation across the globe. The container fleet market is growing at a significant pace due to the increase in use of high capacity vessels which reduces the cost of each container being loaded on to the vessel, and increasing use of fleet management systems. The major driving factor the market for container fleet is growing demand for intermodal transportation for inter-country as well as inter-continental transportation. The large steel containers are transported through various modes of transportation such as from waterways, to railways or roadways without unloading or reloading the goods from the container. This benefit in the field of containerization is impacting hugely on the container fleet market. In addition, the need for refrigerated cargo containers is also in demand and is expected to boost the container fleet market over the years. The refrigerated cargo containers are used to transport temperature controlled goods such as fresh vegetables, fruits, medicines, and even meat. These refrigerated cargo containers are also used to store the goods temporarily with minimum warehouse facility. The non-availability of some ports or terminals with container handling facility is limiting the cargo carriers market which in turn is hindering the growth of the market for container fleet in those regions. The handling of containers in the ports or terminals requires sophisticated equipment to limit unavoidable situations. Moreover, small ports are unable to handle large ships or vessels due to their limited facilities, and the cargo carriers need to operate small ships or barges which increases the cost of entire transportation. This factor is also inhibiting the growth of the market for container fleet. Incorporating analytics in the container fleet market acts as a potential opportunity in the container fleet market to grow over the period. Analytics helps the container fleet market with issues related to network such as container utilization, vessel deployment and terminal operations. Another advantage of incorporating analytics is it helps in understanding the recent trends in the industry as well as forecast mid and long term outlook. The container fleet market is segmented on the basis of types, end user and geography. By types, the container fleet market is segmented as reefer container, dry container and tank container. In the types segment, dry container held the largest market share in 2016 and reefer container is projected to be the fastest growing segment due to the growing need for transportation of goods that requires temperature maintenance. Based on end user, the container fleet market is segmented as automotive, oil, gas and chemicals, mining and minerals, food and agriculture, retails and others. The others segment includes electronics, pharmaceuticals, and energy among others. The automotive industry captured the largest market in 2016 and mining and minerals is anticipated to be the fastest growing end user segment. Geographically, the container fleet market is segmented as North America, Europe, Asia Pacific, Middle East and Africa and Latin America. The largest market share in the market for container fleet in 2016 was captured by Asia Pacific and it is also estimated to be the fastest growing region globally followed by Europe, North America, Middle East and Africa and Latin America. The major vendors in the container fleet market are CMA CGM (France), Hapag Lloyd (Germany), Mediterranean Shipping Company S.A. (Switzerland), Maersk Line (Denmark), Mitsui O.S.K. Lines (Japan), China Ocean Shipping Group Company (China), Westfal-Larsen Shipping A/S (Norway), Evergreen Marine Corporation (Taiwan) Ltd. (Taiwan), Hyundai Merchant Marine Co. Ltd. (South Korea), and Kawasaki Kisen Kaisha Ltd. (Japan).